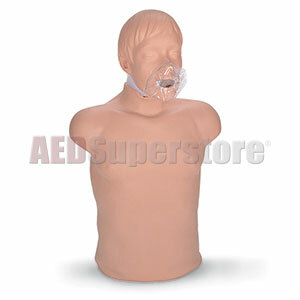 Sani-Man Adult CPR Manikin by Simulaids. Sani CPR manikins have an easy-to-install single-use airway/face shield combination. Anatomical landmarks include the sternum, the rib cage, and the substernal notch. These manikins also simulate realistic head tilt and chin lift, which are necessary for opening the airway. The chest rises to demonstrate a successful rescue breath. The airway/face shield system can be changed very quickly. Using the economical, disposable airway/face shield avoids cross-contamination and does not require cleaning, disinfecting, or disassembly. The carry bag is not included. The manikin is not made with natural rubber latex. Size: 28" x 17" x 9"